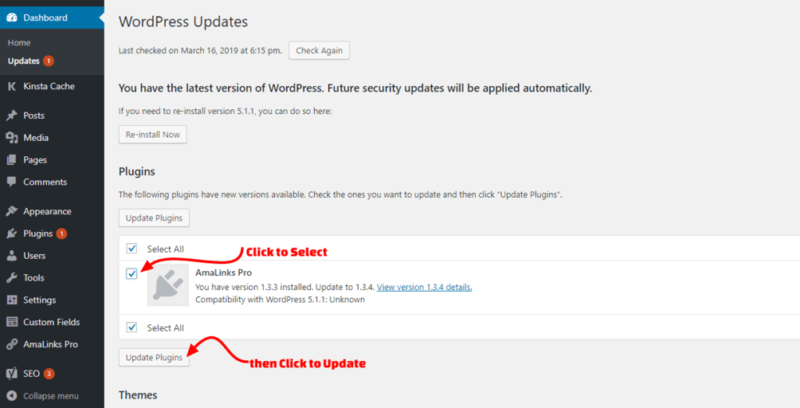 What if auto-updates aren’t working on my site for AmaLinks Pro? You may choose to investigate further and contact support with your hosting company to see why your site is blocking the file transfer. But it might be quicker to just manually install the latest update. Please be mindful that when you have AmaLinks Pro deactivated, none of the existing links on your live site will work. For this reason – be sure to have the new file downloaded first so it will only be moments between the time you deactivate the old file and activate the new one. Also – try to do this during off-peak traffic times for your site (especially if you have a high traffic site). If you wanted to get real technical and safe – you could use a staging environment if your host provides it. But in most cases – you should be able to make this update so quickly that a staging environment won’t be necessary.